As a society, we often look for others to inspire and motivate us to reach our highest potential. We seek out inspirational stories from people who have overcome great obstacles or have found seemingly endless success in their career. ICMI Speakers Bureau is an agency that connects motivational speakers to clients. These people are typically experts in their field, and offer a fresh perspective that encourages the audience to maximize their potential. To become a motivational speaker from a side job to full time, one must decide the message they want to convey to their audience, understand the day-to-day responsibilities, and learn how to project their message to a large audience. The two most common types of motivational speakers are those who motivate others to achieve a career goal, and those who use their own inspiring stories to motivate others to achieve personal goals. Many businesses pay a motivational speaker to come into their office and facilitate workshops for employees to increase overall performance. These speakers offer a unique perspective on workplace responsibilities and teach business techniques to drive production and increase profits. These workshops and speeches include but are not limited to: marketing, sales, technology, and day-to-day operations. Many people seek out motivational speakers when they have reached a major crossroad in life, or are looking for inspirational motivational quotes to venture outside of their comfort zone. Many of these speakers have overcome monumental obstacles throughout their lives, and have used these negative experiences to propel themselves toward a goal. Depending on what type of motivational speaker you become, educate your audience with actionable steps. It is nice to motivate people to feel good. However, it is more powerful to show them how to take action or create an implementation plan. This is what the best motivational speakers do. They provide the “how” along with an inspiring story. In doing so, you can educate the audience to get motivated and take action. The largest day-to-day responsibility for a motivational speaker is staying up to date on all aspects of the field they are representing. They must have a system for idea management to track what is going on. This applies more to speakers who work with businesses than those who are using personal experiences to inspire others. 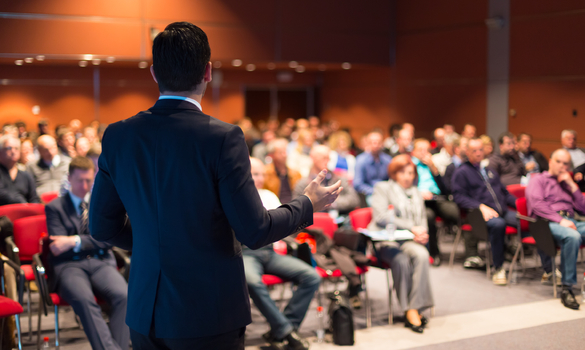 A speaker will want to stay up to date on the latest trends, techniques, and procedures to facilitate the most effective workshops. It is important for motivational speakers to consistently produce publications that go along with their speaking engagements. This can include: blog posts, articles, pamphlets, books, and new material for presentations. When a speaker writes a new speech they will record themselves presenting the material several times in order to analyze and improve the delivery of their message. When a motivational speaker has determined their topic and mastered the delivery of their message, they will need to market themselves and find the most effective medium to reach their intended audience. In the age of technology, motivational speakers are constantly creating ways to market themselves online. They are creating motivational games for staff. Moreover, people promote their message on various social media platforms, produce podcasts, create Youtube videos, and a few speakers have even made Netflix specials. The average motivational speaker does not have the audience to make a tv special and will typically need to use a third party website that connects speakers to clients. A motivational speaker will create a profile on these websites and prospective clients can see their past engagements and determine if the speaker fits their needs.